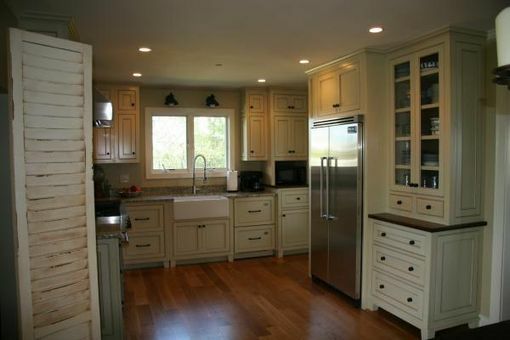 This Kitchen is in updated beach cottge. The cabinets are a Provincial Style. They all have beaded inset face frames. All cabinets are made of maple 3/4" plywood and solid maple lumber. We added lots of extra items to this kitchen such as feet, contrasting beaded board cabinet backs, Walnut countertops on the two hutch style pieces, seeded glass doors, apron sink, dishwasher drawers.